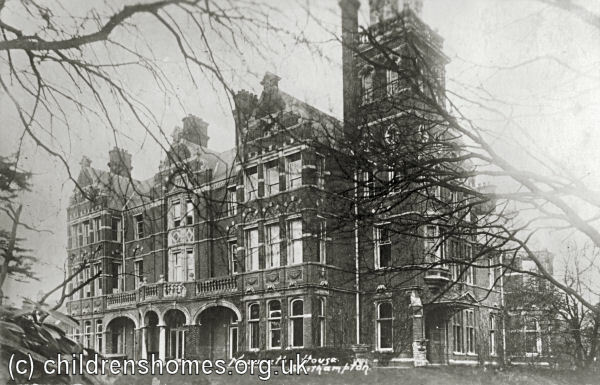 A Nazareth House was opened in 1923 in a property known as Springhill House, on Hill Lane, Southampton. As was usual with Nazareth Houses, the home provided accommodation for the aged poor, and for orphan and destitute children — primarily Roman Catholic girls. Unmarried mothers and their babies were also housed at the establishment. During the Second World War, the home was evacuated to Wardour Castle at Tisbury in Wiltshire. In 1940, the Southampton building was destroyed by wartime bombing. After the war, the Sisters took up residence at Melchet Court, near Romsey, but moved back to Southampton in the 1950s after a new building was erected on the Hill Lane site. The accommodation for single mothers was closed in 1985. In 2000, the site was sold and is now covered by modern housing.